Michael Horn is an artist who is not afraid to confront the question of what it is to be a painter. How to make paintings that are true to a lived experience while using a personal and formal visual language? As Michael says, ‘To seek a way, without using irony, pastiche or archness to affirm a faith in painting and its ability to renew itself’. 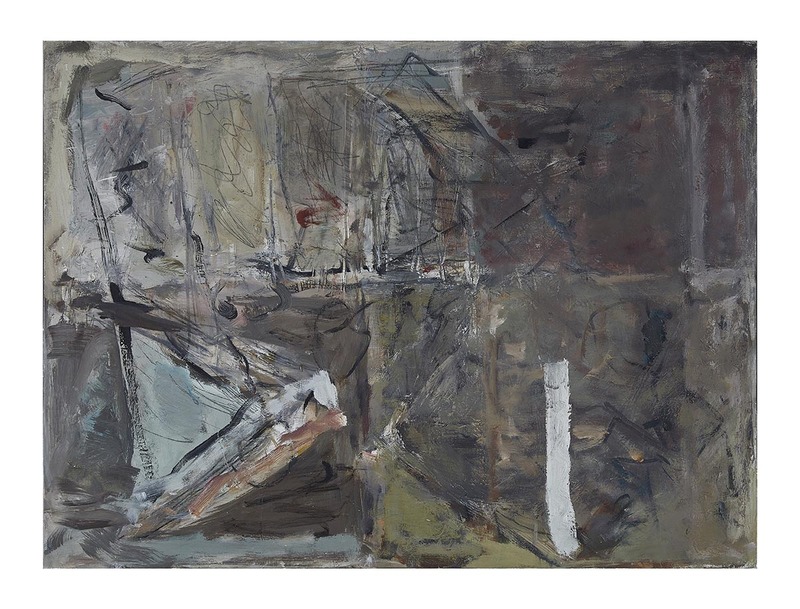 The themes of his paintings are both complementary and contradictory. Organising these often disparate elements is crucial to the depth and resonance of the completed works. 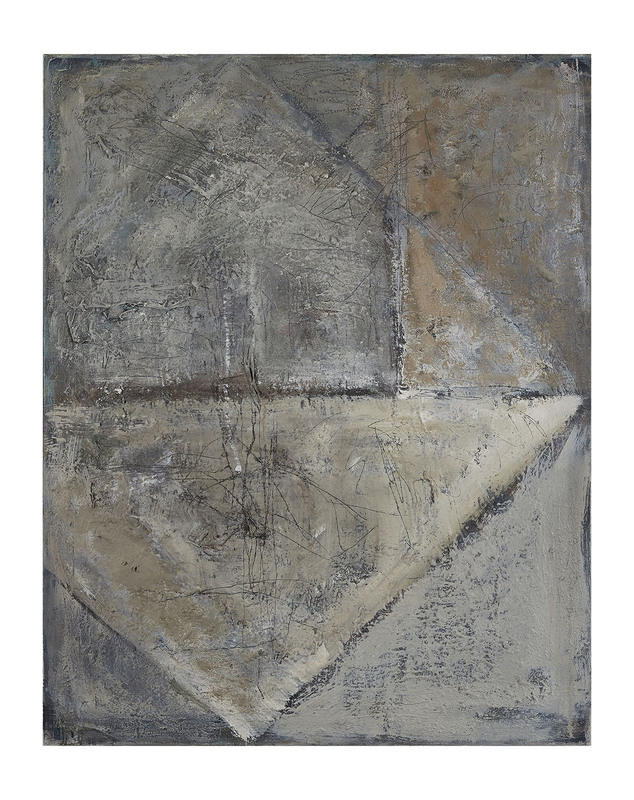 The history and development of the painting are there to be seen, often as underlying textures, marks or colours. A creative journey, painting as discourse or process, subject to change and constant revision. In this sense, the works are never ‘finished’ but represent a point in time and are true to that moment. Earlier works constructed a complex visual language using geometric shapes, one he has made his own. Jasper Johns and Paul Klee have been important influences as they both, ‘Somehow revealed our own world by creating another’. As painters we are all aware that paintings are fundamentally abstract. Our attempt to create on a flat surface is something that reflects sensory experience as well as complex thoughts and feelings through a parallel reality. As Picasso said, ‘Art is a lie, that makes us realise truth’. Since moving to Norfolk over 25 years ago, he has expanded his formal language ‘To let the landscape in’, to find a way of balancing practical experience and the metaphorical, while still utilising his formal ‘architecture’ or ‘scaffolding’, to build structure and form. 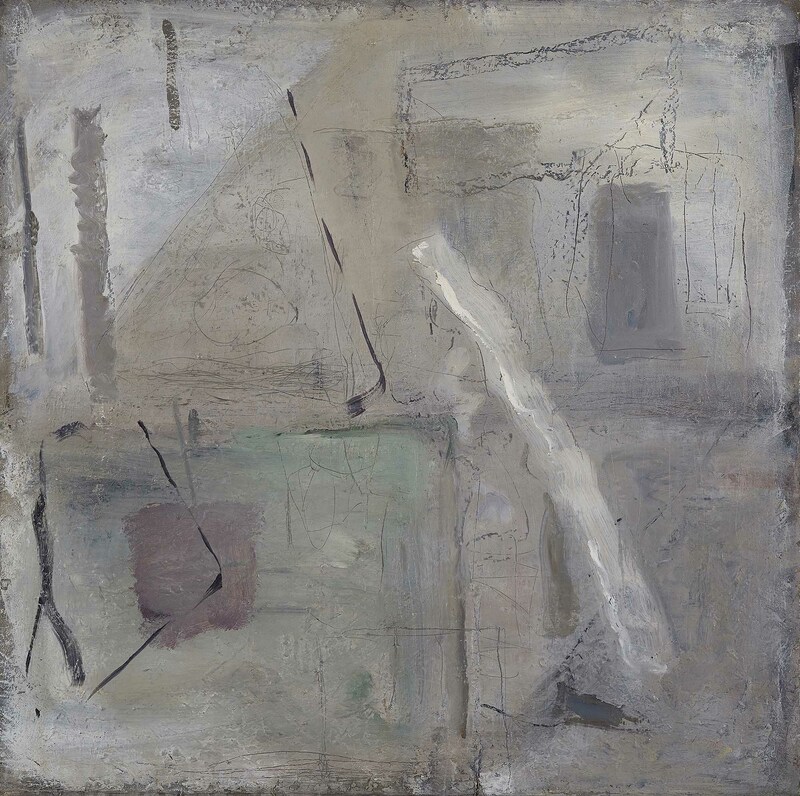 His experience of cycling and walking around the lanes and footpaths of what is still a rural landscape with wide open vistas of land, coastline and sea, is key to Michael’s increasingly confident expansion of his pictorial language, ‘a reflection of what I see against a more independent language’. The paintings in this exhibition are evidence of this, being grouped very loosely into three themes. ‘Towards the Sea’. These works relate to the unique atmosphere and luminosity of the Norfolk Coast. Not in any literal sense, but with allusion and metaphor; some indeed are suffused with a sense of light that can be found in the most naturalistic of paintings. ‘Weavers Way’ is close to his studio and he walks here regularly in all weathers. His experience of the landscape, the rain and wind, as well as the huge Norfolk skies, all feed into the paintings. ‘In the Studio’. The studio interior as well as the objects within, (often of a deeply personal symbolism), are introduced into the work, with all the motifs being re-created through a formal visual language. Many of these works are on paper, often with added collage. They have a playful quality, a sense of a rare artistic sensibility creating something out of nothing, but always with an underlying seriousness of purpose. These works rewards contemplation. They give up their secrets slowly. As befits complex and multi layered works, more is revealed the longer one looks. 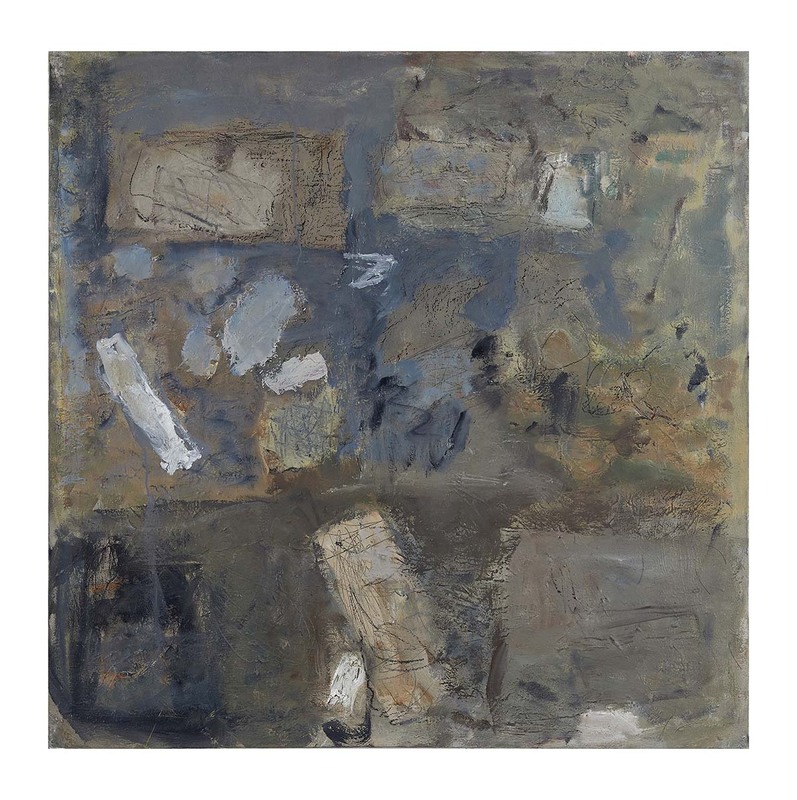 What at first appears to be an earthy or sombre palette, begins to show sometimes astonishing hints and tones of subtle colour woven into the fabric of the painting. These are multi layered canvases, the result of many workings. He builds surface density and depth, sometimes with the addition of collage, which he uses to ‘break into the surface’. 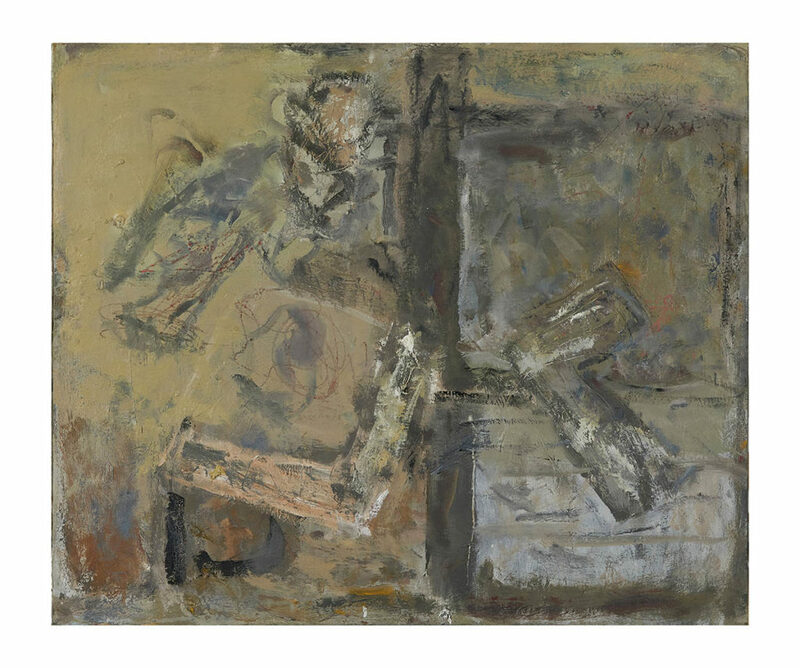 Each time the painting is worked upon, he is questioning, exploring, making and removing marks, colours, textures and tones; and always with an over-arching painterly instinct, ‘To make an end is to make a beginning’ as T. S. Eliot wrote in the ‘Four Quartets’. These are ambitious works which forge new realities in a formally and aesthetically satisfying manner. They give us a diversity of feeling; in turn, or at the same time, meditative, sombre and reflective but also containing great joy and creative energy. As a painter friend of mine once said, ‘The emotion that goes into a painting, comes back from it again when someone looks at it, how that happens I don’t know, but it’s a form of magic’. This is so true of this work. In a sense the man and the painting are indivisible. 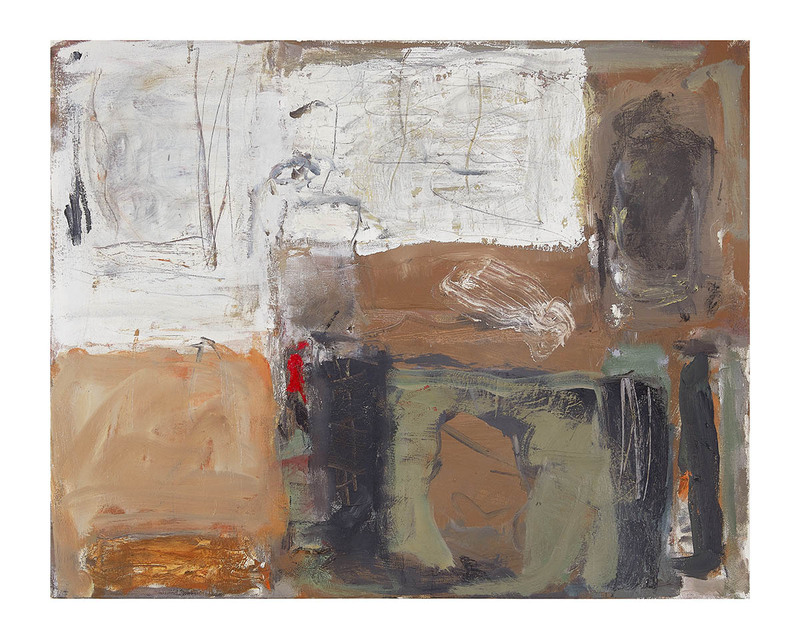 To talk to Michael in his studio, surrounded by his paintings is to be aware of his humility, his ever questioning intellect and the strength of his commitment to ‘making work of the utmost seriousness’. His response to painting and to life is ever thoughtful, considered and honest, for that is the man. These paintings are Complex and multi layered, the result of many workings, more is revealed the longer one looks.